Russian Circles' fifth studio album, Memorial, is the first landmark post-metal release since Isis' Panopticon, the band's greatest achievement, and unquestioningly one of 2013's true artistic masterpieces. Post-metal is at an unfortunate place in its still-young history. Despite an ever-growing sea of bands that bear or are associated with its name, creativity-wise the genre has formed a quagmire of indiscernible copycats. Though it fares marginally better than its slightly older brother-in-arms, post-rock, a style full of groups convinced that they alone know the perfect crescendo, on the whole the odds of happening upon another Isis are increasingly low. As Dean Brown put it in his Mixtarum Metallum column earlier this year, "In the year 2013, the last thing you want to be accosted by is post-metal. This sub-genre was hammered to death by the volume of neck-beards who discovered Isis and Neurosis, and then decided to form groups which stole everything but the vitality of these two bands and bored everyone to tears with incremental build-ups and crescendos that you could see coming a mile away." This state of affairs isn't just something that high-minded metal critics have concocted out of some misinformed cynicism. Those who play in the "post" genres feel it too. Brian Cook, one half of Russian Circles' rock-solid rhythmic foundation, shares the sentiment, telling Ghost Cult: "All due respect to Explosions in the Sky, but I just can’t listen to the countless knock-offs they’ve generated. It’s like, I get it, you have a delay pedal and you know how to play a minor scale on the guitar. Do something more with the formula." Those who consider themselves devotees to the genre may be put off by Cook's statement, but if there's any outfit in the past ten years that's been able to stake a claim as a true catalyst for forward-thinking songwriting in post-metal, it's Russian Circles. Over the course of four studio records, the Chicago-based trio of Cook, guitarist Mike Sullivan, and drummer Dave Turncrantz has risen to become one of the mightiest instrumental metal outfits around, combining a well-honed sense of dynamics with a keen ear for layered riffs in a manner unlike anyone else in the field. On their first two LPs, Enter and Station, Russian Circles play a variety of post-metal that's clean and angular. As Cosmo Lee rightly observes in his Pitchfork review of Station, "Clean tones ring cleanly, but so do the dirty ones," the larger point being that even the heavy moments of intense riffs nonetheless feel regimented, tightly wound. This sonic works marvelously on Station, whose mood and aura evoke the forward march of soldiers advancing to battle, a point made a little more than obviously by the album's sleeve art. Not content to replicate this style, Russian Circles then advanced into promising territory on Geneva not but a year later, taking the sharply drawn sonic lines of Station and letting them blur just a bit. Geneva's title cut, featuring one of the greatest bass drops ever recorded, is indicative of the newfound gusto in the band's otherwise heavy sound. The distortion is rougher, the drum hits more chaotic, yet amidst this metallic roar, the foundational strengths of the trio remain intact. Sullivan's skill in looping multiple guitar lines is still plain to hear, and Turncrantz, arguably the strongest drummer in heavy metal currently, is always keeping the rhythm in control throughout the compositional ebb and flow of the band. Cook, who joined the trio on Station and became a permanent member shortly after, proved to be the ideal complement to Sullivan and Turncrantz, his rumbling basslines giving a low-end counterpoint to Sullivan's frequently high-register loops. Whether in a live setting or in the studio, Russian Circles possess an interplay that few groups in any genre ever achieve; never does it feel like one musician is trying to upstage the other, and never is a voice crowded out. All of these strengths reached a peak on 2011's Empros, a record that, at the time, seemed like it'd be impossible to top. It contains some of the band's sunniest melodic lines (the opening to "Mladek") as well as its heaviest (Cook's earth-rattling bass on "309"), and on the whole it best represents the most distinctive iteration of the "Russian Circles sound" out of any of their first four studio outings. After Isis broke up following 2009's Wavering Radiant, Russian Circles' rise to prominence was all the more plain for everyone to see. But as it turns out, Empros wasn't a peak. Or, rather, it wasn't the peak. It was a warning sign. Memorial doesn't insist upon itself the way you might think a great metal album would. It runs a mere 38 minutes, with the mean song length amounting to just four-and-a-half minutes -- an anomaly for both Russian Circles and post-metal in general. The riffs don't bludgeon the ears; the record is much heavier in mood than it is amplifier gain. 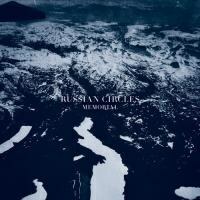 All throughout its concise runtime, however, Memorial maintains a perilously difficult tug-of-war, simultaneously reining in Russian Circles' stylistic facets while also expanding their capabilities into new realms. More than any other Russian Circles LP, the tracks flow together harmoniously, with the final notes of one segueing into the other with ease. In the aforementioned Ghost Cult interview, Cook notes that he and the rest of the trio view the songs as "stand-alone", which is certainly an accurate description in many respects. A cut like the meditative "Cheyenne" does have the honed-in quality that makes it easy to take on its own terms, but one sit through Memorial makes it hard to take out of context. It would be inaccurate to label this a concept album, but in its clarity of vision and brilliance in composition it evokes a specific image, one captured gorgeously in its sleeve art. Like its sonic predecessor "Schipol", the highlight track from Empros, Memorial envisions Russian Circles out in some wintry wilderness, crisp winds gliding flakes of snow across fingers picking an acoustic guitar. Guest vocalist Chelsea Wolfe, whose famously reverb-filled vocals form a crucial element of Memorial's closing song, gives a performance that sounds as if it were captured echoing through ice-capped mountains. All of this is bound together by a melancholy that fans of doom metal, particularly the version of that genre played by groups like Katatonia, Ghost Brigade, and Swallow the Sun, would find enticing. Such specificity of image is difficult to achieve when making instrumental music, but this trio is now five studio records into an already impressive career. If anyone is bound to be making music this good, it's these guys. As much of a leap forward as Memorial is for this band, there's still an inviting familiarity present. "Deficit" and "1777" open the album in traditional Russian Circles fashion, offering up a whirlwind of mood shifts, drum hits, and satisfyingly punchy riffs. The dynamic shifts, as with Empros, are not always easy to predict, and often even the smallest acts of restraint pay huge dividends. Turncrantz' drumming at the start of "1777" is exemplary of this; starting with a tapped cymbal matched with alternated hits of the snare, the beat then indicates that the bass drum will come in to fill in the void left after the snare is hit, but Turncrantz holds back from stomping on the pedal for just a few measures, enough for the cymbal and snare hits to build up tension. A small decision it is, but it's a crucial one, and it shows just how attentive these three musicians are to maintaining a compositional tautness that goes beyond the requisite build-up to crescendo. "Cheyenne", the most outright pretty Russian Circles song to date, takes the first half of its four minutes ever-so-slightly amping up the volume of Sullivan's guitar arpeggio, backed by a simple, four-note bassline by Cook, and just when one might think Turncrantz to come in and drive things to a thunderous climax, the music quietly simmers down. Few bands aside from Earth have the ability to so deftly toy around with the listener's anticipation of dynamic changes. The most straightforward track, the brooding "Lebaron", is on its own terms less dynamically interesting than anything else on Memorial, but as a forceful lead-in to the tranquil farewell of the title cut, it's exactly what's needed to bring things to a conclusion: a final storm before the mournful calm. At its core, Memorial is a tome poem, beginning and ending with the same fingerpicked acoustic guitar motif. "Memoriam" commences the album as a short teaser, a lead-in to all that follows after it. Wolfe's vocals head up the breathtaking "Memorial", which is not only just this record's swan song but also an ideal candidate for audio backing to anyone's passing. Memorial is a somber and serious recording, but like the best metal, instrumental rock, or, hell, just music in general, it's ultimately life-affirming. None of the things it does aren't anything that bands of Russian Circles' ilk haven't tried before, but not in a long, long time has anyone successfully managed to transcend the generic fray and craft something spellbinding from front to back. Russian Circles happen to have the benefit of not needing to feel like there's a wheel to be reinvented. This far into their career, they know the sound they've forged, and with each recording since Station, they've gradually refined it, and it certainly seems that if this isn't perfection, it's near impossible to imagine what could come next. They've grown comfortably rather than forcefully into the role of post-metal titans, a fact evidenced by their natural sonic evolution that has opted for nuanced, unpretentious songwriting rather than anything overly ambitious. The result of this incredible journey, Memorial, is the first landmark post-metal release since Isis' Panopticon, Russian Circles' greatest achievement, and unquestioningly one of 2013's true artistic masterpieces.